What Size Oxygen Absorber Do I need? Although 4 out of 5 Americans live in counties that have been declared federal disaster areas, 53 percent do not have a minimum 3-day supply of nonperishable food at home. You do not have to buy expensive emergency food! Mylar bags and oxygen absorbers protect from mold, bugs, and oxidation for over 25 years, and you can easily package food yourself. Pick a reputable manufacturer to insure your bag is an excellent oxygen barrier. Importers who buy “mylar bags” off of Alibaba often don’t realize those bags are PET, which is not Mylar as claimed. They are thick and cheap, taking advantage of the common thought that thicker must be better. But, it is metalization that keeps oxygen out, not PET. Only store food that does not need refrigeration. Use a plastic bucket or container for extra physical protection and store in a cool, dark place off of the ground. Use extra absorption to lengthen storage time. Unused oxygen absorbers may be stored in a mason jar or vacuum sealed. All Mylar bags must be heat-sealed, (even zip locks) which is easily done with a household iron or hair-straightening iron. Our partners and suppliers are local and ALL have been leaders in the California packaging industry for decades. We send along a long-term food storage guide to help you through the process and personal help is only a call or email away. PackFreshUSA unconditionally guarantees your happiness with our products and will help you see how easy it is to store your own emergency food. A PackFreshUSA Mylar Set is all you need! We usually speak very highly of oxygen – after all it is a basic necessity of life. But it is also very destructive, changing things around us at a molecular level. Oxygen either directly causes food spoilage through oxidation or it supports other organisms that ruin our food by being one of their basic necessities of life too. Oxidation is why iron rusts, newspapers yellow, and silver tarnishes. It also causes many nasty changes to food products that change flavor, texture, appearance and nutritional value. In addition to directly causing damage, the presence of oxygen permits all sorts of organisms to infest food, sometimes causing great harm. Oxygen is required for all these awful things to happen and that is why removing it can have such a dramatic effect – without adding chemical preservatives! Oxygen Absorbing Packets (also known as Oxygen Absorbers, oxygen scavengers, and oxygen eaters) chemically trap available oxygen from the surrounding environment. Because oxygen is very destructive, Oxygen Absorbers are very useful for a variety of preservation applications, especially long-term food storage and commercial food packaging. They are also frequently used for pharmaceuticals, birdseed and pet food, medicinal herbs and artwork/artifact preservation. Oxygen absorbers are more affordable AND more effective than vacuum-packaging and gas flushing, which are the other leading preservation methods. Oxygen removal preserves without chemicals or additives. They are non-toxic and categorized by the FDA as GRAS. (Generally Recognized As Safe) Oxygen absorbers are not a substitute for refrigeration or freezing and should only be used with dry, shelf-stable foods. Oxygen Absorbers contain an iron powder formulation that becomes iron oxide in the presence of oxygen, chemically removing the oxygen from the environment at a molecular level. An oxygen absorber is like a sponge that will continue to absorb oxygen until full and needs to be kept sealed prior to use to insure it will absorb its full capacity. They come in many sizes and are rated according to how much oxygen they will absorb. If you like to keep things simple, you can buy a Mylar / Oxygen Absorber set and not have to worry about food types and cc's. The Oxygen Absorbers PackFreshUSA includes with our sets are enough for any food type and any situation. Our sets have been created so that any food type can be put into one of our Mylar bags and the Oxygen Absorber we send with it will be large enough to deoxygenate the bag when it has been filled with food. 200cc worth of oxygen absorbers are actually enough for a quart container, but as our quart bags can hold more than a quart, we use 300ccs in our Mylar sets. Not only is it okay to use more absorbing power than necessary, it is a great idea. For one reason, food types can be deceiving and may contain far more air than you thought. Flour can be 50% air! Pastas can be 75% air! A larger capacity Oxygen Absorber will help account for this. Also, even if there was a tiny leak in the seal, a larger absorber will continue to absorb incoming oxygen, even many years later. Oxygen Absorbing Packets (Oxygen Absorbers) are rated according to how much oxygen they will absorb, e.g., a 100cc Oxygen Absorbers will absorb 100cc's of oxygen. There are different types of oxygen absorbers, but PackFreshUSA only sells the most versatile type. They contain an iron carbonate formulation, along with a tiny amount of entrapped water, and they chemically trap available oxygen from the environment. This process creates iron oxide, which is the same process that makes a nail rust. This reaction is exothermic, meaning that heat is released as the oxygen is absorbed, but not enough to be of concern during normal use and you likely will not even notice. Oxygen absorbers are not air absorbers. Sometimes users expect to see a dramatic vacuum effect, but while it is true that you are likely to notice a volume decrease, oxygen is only 21% of air and the rest of the air will always remain, regardless of how many Oxygen Absorbers are used. The rest of the air is mostly nitrogen, with trace amounts of some other gases that are inconsequential to food storage. First, we need to know the volume of the container we are going to deoxygenate in cc's. (cubic centimeters) Oxygen, as a gas, is measured in cc's, and containers are typically measured in milliliters, (ml) but conveniently, 1 ml = 1 cc. Google is great for this: For example, if we have a pint jar, you can type in the search bar, “1 pint in mls” or “16oz in mls” and you will learn that a pint jar is roughly 473ml which is 473cc's. So, a pint jar holds 473 cc's of air. To account for the product volume, you need to know how much air is in the product. 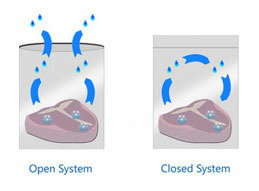 Air is contained in the product in two ways: embedded air contained within the food particles and interstitial air in-between the food particles. There can be a surprising amount of air within the food itself and this air needs to be accounted for. A lot of misinformation on the internet is related to people thinking items with small particles (like flour) are “dense” and therefore have less air volume, but particle size is actually not important. Believe it or not, a pool filled with marbles will have the same interstitial air volume as one filled with basketballs. Yes, the basketballs will have much larger pockets of air, but there are far fewer of them. Think of a checkerboard with just 2 large black squares and 2 large white squares... ½ of it's area is black and ½ white. What if it had 100 small black squares and 100 small white ones? 1000? Even with tiny squares it is still ½ black and ½ white as long as the squares are all a uniform size. What does matter is particle size distribution, or in other words, whether you have particles that are all a uniform size or if you have a lot of particles of different sizes. If you have a pool filled with basketballs AND marbles, the marbles can fill in all the large pockets of air. So, products with uniform particle sizes will have more interstitial air than products with a greater distribution of particle sizes. The other really important factor is degree of agglomeration, which just means how tightly everything is packed. Unsifted flour contains less air than sifted flour because it is more agglomerated. It is always best to pack food tightly to give it the smallest possible air volume. If your product soup measures 2 ½ cups, you know that ½ cup of the product was air, or it was 50% air by volume. If your product soup measures 2 ¼ cups, then ¾ cup of the product was air, or it was 75% air by volume. The term “Mylar” is almost always misused. In the long-term food storage community, Mylar is thought of as a silver material that is used to make most long-term food storage bags, and of course, the thicker the better, right? Believe it or not, ALL of these assumptions are inaccurate. Mylar is a trade name for a material developed by DuPont that is transparent, and while it is used for flexible packaging, the food storage bags sold online are virtually all metalized poly bags imported from China. 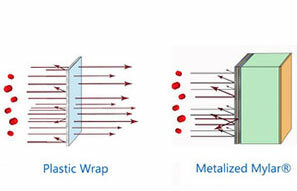 Just as any transparent tape is called “Scotch” tape, or any tissue is a “Kleenex”, any metalized poly bag is often sold as “Mylar”. Then what is it really? Mylar is a special form of polyester that is stretched in a manner that gives it remarkable strength for its thinness. Since it was invented by DuPont in the 1950's, Mylar has been used for drum heads, insulation, wall covering, and even as a trampoline in early advertising videos. As one of the strongest flexible materials ever created, it also works very well as protective packaging. In its natural form, Mylar is transparent. In order to enhance its oxygen-barrier properties, a layer of aluminum is added, creating an extremely durable film that is virtually impervious to the oxygen that spoils food. For long-term food storage, the thickness and quality of this metal layer is vital to its effectiveness as an oxygen-barrier. Imported bags keep getting thicker and thicker, touting more and more “mils” but the implication of better protection is deceptive. If these manufacturers invested in a thicker metal layer they would be better for oxygen protection then just a thicker core. In order to create a hermetically sealed storage environment, Mylar MUST be heat-sealed. (even those with ziplocks) Our Mylar bag sets can easily keep an oxygen -free atmosphere for 25 years when used with our oxygen absorbers. For those that truly want the best, our premium Century bag sets are estimated to give you a century of oxygen protection. When creating a long-term food storage plan, it is best to imagine using it. If tonight you needed to use your food supply to feed your family, what would be easy to fix? What would they ask for? It wouldn't make much sense to fill 5 gallon buckets with rice if your family hates rice, or save flour if you don't know what to do with it. There are plenty of great food storage choices, so pick the ones that are best for you and your family. Remember to include spices and treats too. 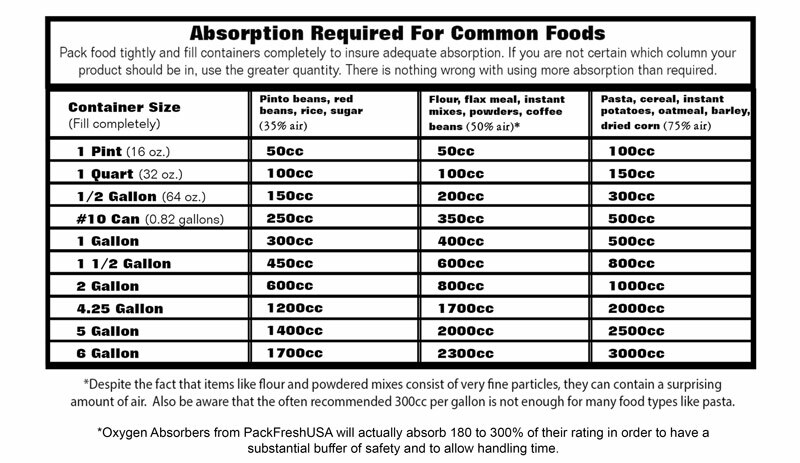 Oxygen Absorbers must only be used with food that has a low moisture content. (under 15%) If a food product normally requires refrigeration after opening then that means it is susceptible to anaerobic bacteria, and needs to be canned or frozen to be stored long-term. You can often keep products in their original packages, but if you do, poke a couple holes in the packages so that the oxygen will be removed. Most products are packaged using gas flushing to reduce oxygen levels, but Oxygen Absorbers do a much better job. Coffee beans will give off a gas. They CAN be stored long-term but if you use a Mylar bag you may see it puff up a little over time. Salt, sugar, honey and cornstarch do not spoil and do not need Oxygen Absorbers. You may choose to add a desiccant to buffer the moisture level but it is not necessary. Iodized salt may become yellow over time but the color change is safe and will not effect the quality otherwise. When storing food for emergencies, keep in mind the present likes and needs of your family. Plan to have variety in your meals and consider creating a weekly menu and store meal items together. Plan meals and food items that do not require a lot of preparation. Include spices, condiments, desserts and other pleasures. These are things you will really appreciate in an emergency. Instead of using a 5 gallon bucket to store a large quantity of only one item, use the container to hold several smaller bags of that product or of different products. Smaller amounts are more convenient when it comes time to use them, and you won't need to unseal more than you need. Rotate your food supply by using it and replacing it. Oxygen Absorbers with appropriate containers can keep food safe for decades, but it is a much better idea to keep a rotation going than to test the limits of your food storage system. Do not forget about pet food. Coffee, vitamins and seeds to grow food are other items to remember. Your food is well-protected and can be stored just about anywhere, but ideally, store food at least 6 inches off the ground in a cool, dark place. Consider storing food in multiple places. If a disaster occurs then you may be prevented from reaching some places. Your Mylar bag will look vacuum-packed when the oxygen has been removed. You can increase the chance of seeing the vacuum effect by packing the food tightly and being certain there is very little air in the package. However, especially if you are storing pasta, potato flakes, cereal or other items that contain a lot of air, there may be too much air within the product itself for you to notice the 21% decrease and there is nothing you can do about that. It is important to confirm the freshness of the Oxygen Absorbers as you put them in because there is NOT a reliable way to know they have worked after they have been sealed in a Mylar bag. This myth is probably why people seem to think some oxygen absorbers do not work and this has caused a lot of unnecessary worry. If they pass the freshness test found in our directions then they will always work. Perhaps this should have received top billing for being the most common. A gallon container holds 3785cc's of air. Because oxygen is 21% of air, that means 795cc's of oxygen are in a gallon. 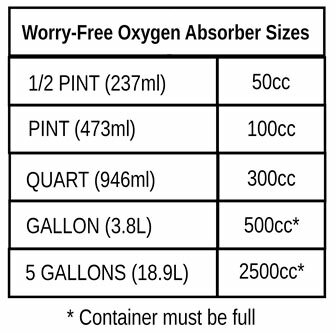 You would need a 800cc Oxygen Absorber to clear an empty gallon container of oxygen. If you were to fill the container with flour (which is about 50% air – see below) then there should be 400cc's of oxygen in the filled gallon container and it would take a 400cc oxygen absorber to absorb all the oxygen. Fortunately, there are two reasons that people using a 300cc for a gallon are okay most of the time: 1. A Mylar bag will form around food and the actual volume is often LESS than a gallon. 2. Oxygen Absorbers typically absorb MORE than they say they do. (ours absorb 180 to 300% of their rating) But if you are using a jar or storing pasta or another product with a lot of interstitial or embedded air, or some other circumstances, the 300cc may not completely deoxygenate the container. There is a site out there that recommends 400cc for 5 gallons of flour! While ziplocks can help hold product in place, many people seem to assume they are meant to seal your food for storage. ALL Mylar bags must be heat-sealed. This is irresponsible on the part of the manufacturers and retailers who take advantage of the fact that this sounds like a good idea. It actually is not. First, simply vacuum sealing is not enough for long-term storage and too much oxygen will be left behind. Second, if you do use an Oxygen Absorber in one of these, vacuum sealing is not only unnecessary, it tends to keep oxygen in the bag longer by inhibiting circulation. These bags are mostly just a waste of money. There is a site that mentions injecting nitrogen in addition to using an Oxygen Absorber. 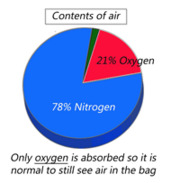 The air we breathe is over 78% nitrogen, 21% oxygen and some trace amounts of other things. When the Oxygen Absorber removes the oxygen, what you are left with is already going to be over 99% nitrogen. If your Oxygen Absorber contains iron oxide don't use it! That means it has been exposed. They do, in fact, contain iron, and when the oxygen is absorbed the iron turns INTO iron oxide. Iron oxide is rust, so the reason Oxygen Absorbers work is they rust. You should check your new Mylar bags for leaks. Some may have small holes at a folded crease. This is another misconception that has caused a lot of unnecessary worry. Mylar is one of the toughest flexible materials ever created. The film we use to make these can take the weight of two and a half cinder blocks over EVERY square inch. Folding does not put holes in it. Normal Mylar film is actually transparent. People are more familiar with a special kind of Mylar that looks metallic because a separate layer of aluminum has been added. Mylar is very flexible, but metal is not. Normal use such as filling it or moving it will cause tiny breaks in the foil layer that you may sometimes see if you hold it to the light - but don't worry, they are not holes. This happens with all Mylarfoil films and their barrier properties are not significantly effected. How Long Can I Store Food This Way? People always want to know, “how long will these methods protect my food?” The answer to that depends on the oxygen-barrier qualities of the container and the capacity of the Oxygen Absorber. Removing oxygen is an amazing way to protect perishables. That is why important things like “The Declaration of Independence” are stored in an anoxic (oxygen-free) environment. If there is no oxygen, oxygen dependent organisms like mold, bugs or other infestations cannot exist. Oxygen is also extremely destructive itself through oxidation, the process that turns a freshly cut apple brown and iron into rust. These are the things that cause the most damage to food products. The only complete barriers to oxygen are glass and metal. (thicker than 15 microns) All plastics will have an Oxygen Transmission Rate, (OTR) which is the amount of oxygen you can expect to penetrate the plastic over a period of time. Typical sandwich baggies for instance, have a very high OTR and are basically useless as an oxygen barrier but other plastics like PETE or HDPE have a very low OTR and can even be used for long-term food storage. Mylar is a member of the polyester family which has been metalized to give it outstanding barrier properties. Mylar bags have extremely low OTRs, but the OTR can vary depending on the quality of the metalization. Most of the “mylar bags” sold online are not actually made of genuine Mylar, rather they are imported metalized bags. Learn more here. Our Genuine Mylar bag sets will keep an oxygen-free environment for over 25 years. Our premium Century Mylar bags sets should keep oxygen out for over 100 years. Glass has an OTR of zero, so Mason jars make excellent containers. They can keep an oxygen free environment indefinitely. Because oxygen will gradually trickle into just about any container, using a larger capacity Oxygen Absorber (that can continue to absorb incoming oxygen) will keep it from accumulating and lengthens the storage time. Oxygen Absorbers do not “expire” and will continue to absorb until they are full, even if many years have gone by. What about light? All forms of energy such as light can cause molecular breakdown but light does not contaminate food, it just may have an effect on it's quality. Still, it is best to choose a storage area that is dark and cool. Most food will not be significantly effected by light damage but choosing a dark storage area or using Mylar bags is always the best idea. Even though Oxygen Absorbers used with Mylar bags or mason jars can keep food protected for an astonishing period of time, it is a much better idea to rotate your food supply annually by actually using it. Freezer burn is a problem we are all familiar with... but what exactly is it? Over time, the texture of food stored in the freezer becomes dry, brittle, or leathery, vivid colors turn to shades of brown, and flavors become bland or downright detestable. There are two things going on that cause these changes to frozen food: Sublimation and oxidation. Water can turn to vapor inside the freezer just as it does outside. 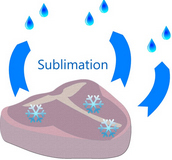 Just as a puddle of water evaporates into water vapor, a similar process called sublimation will happen where frozen water will transition to vapor – completely skipping the liquid phase! This water vapor transition occurs on the surface of the food stored in your freezer. Water molecules migrate to the surface where they either remain as a frosty covering on your food or they become water vapor that escapes into your freezer, traveling to the coldest areas such as the walls. Here, sublimation often creates a brilliant ice cave out of the water from your food leaving your food dry. Oxygen is also very destructive. 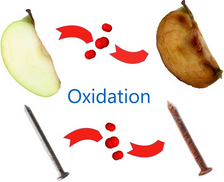 Oxidation is the process that turns a freshly cut apple brown and iron into rust. It is responsible for the stale taste in old food as well as loss of nutritive value and color changes. Fats within food oxidize and become rancid. Oxidation will occur even when sublimation does not, and will happen throughout your food, not just on the parts that dry out. The longer something is in the freezer, the more it is subject to the processes that cause freezer burn. In order to keep water from leaving your food to travel around your freezer, you need to create a closed system – or at least get as close as possible – so that the water vapor leaving your food is equal to the water vapor absorbed by your food. Vacuum sealing is a pretty good choice. Freezer bags and carefully wrapping in plastic wrap will offer a fair amount of protection too, but none of the plastic products available at your local store will completely keep water vapor in, or keep oxygen out. Preventing oxidation is even more difficult. (or at least it used to be) Oxygen is very sneaky and the only complete barriers to it are glass and metal. Plastics vary greatly in their Oxygen Transmission Rates, with plastic wrap being almost useless to HDPE or PETE plastic that can keep oxygen at bay for a few years if properly sealed. PackFreshUSA specializes in flexible barrier packaging and oxygen-free technology, bringing the protection of commercial product packaging to your home for the best protection available. With our products you can create a sealed environment with a water vapor equilibrium that inhibits sublimation and an oxygen-free atmosphere that prevents oxidation. Oxygen absorbers are not a substitute for refrigeration or freezing. For long-term food storage they should either be used with dry, shelf-stable items (they should have a moisture content of less than 15%) or with frozen food. Food items that we are used to refrigerating are subject to anerobic bacteria, which are the only organisms that oxygen absorbers wont prevent. Oxygen absorbers CAN be used in conjunction with refrigeration or freezing - with a few minor changes – and you can greatly improve the quality of your refrigerated or frozen food. They can prevent mold on cheese, keep bread items fresh, keep guacamole green, and save meat from freezer burn. Temperature greatly effects the rate at which oxygen is absorbed. For every decrease of 15° F, it takes about twice as long for oxygen to be absorbed. Because it can take over 5 times longer to deoxidize a container in a freezer it may sometimes be appropriate to place it in the refrigerator for 24 to 48 hours before moving it to the freezer if it is safe to let it be at that temperature for that period. Vacuum sealer bags are good to use if you will be using the product within a few months. Mylar is far superior for longevity, but quality vacuum sealer bags like those from PackFreshUSA can keep an oxygen free environment for several months. Do not use oxygen absorbers to extend storage time in the refrigerator. Also limit the amount of time food spends in the “Danger Zone” between 40° F and 140° F, always cook raw meat to an internal temperature of 165° F, and practice good hygiene and food safety guidelines. Food packaging has taken a great leap forward in the past two decades with oxygen absorbers and barrier films such as the metalized Mylar® from PackFreshUSA. This technology has the ability to maintain an oxygen-free atmosphere for decades, preventing oxidation and contamination from mold, bugs, and other oxygen-dependent organisms.